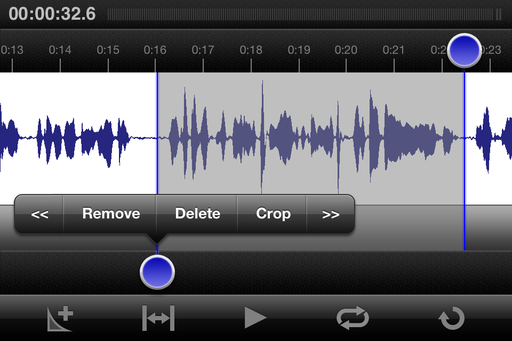 You can record serious audio with your iPhone. With the new Rode iXY Stereo Recording Microphone for iPhone/iPad ($199) combined with the Rode Rec app in iTunes ($5.99), you can create audio for movie voiceovers, interviews, ambient environment, and more. Here's a sample recording with the RÃ˜DE iXY mounted to my iPhone 4S. The recording was captured with me holding the iPhone in my living room. I did not use the included windshield or a pop-screen on the mic. The file is unedited, but compressed to MP3. You can also download the audio test here (42 seconds). RÃ˜DE has put together a powerful tandem of hardware and software. In my sample recording with an iPhone 4S, I chose my living room at home and recorded without the foam windshield that comes with the mic. I could monitor my input with headphones while I spoke. I used the "Hiss Reducer" preset that's located in the Input menu for the app. Once I finish a capture, it's added to the Recordings menu where all of my "raw" files are listed. I say it that way, because I'm capturing at 44100 Hz (can go to up to 24-bit/96k Hz) and in mono (stereo is available too). But when I share the file, I have the option of sending it out as an AIFF, WAVE, CAF, AAC, Apple Lossless, FLAC, or Ogg Vorbis. The master audio remains in my Recordings menu until I remove it. Editing in the RÃ˜DE Rec app. I can edit what I've recorded on the iPhone or iPad before I share it. This is a terrific timesaver when working on the go. Rotate the phone sideways to reveal the editor. Tap and drag downward to select an area. Tap on the blue dot to reveal the contextual menu with options for your selection. It's easy and works great. 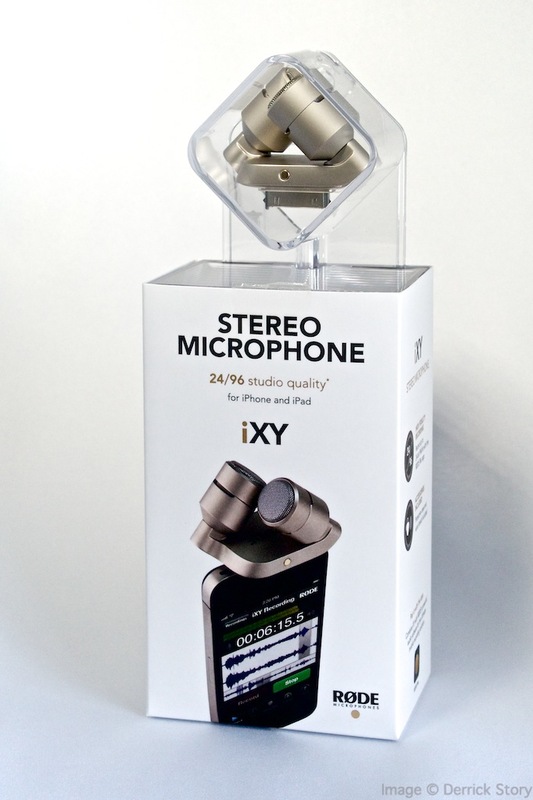 The RÃ˜DE iXY Stereo Recording Microphone for iPhone/iPad is a quality stereo microphone that converts your iPhone into a high resolution audio recorder. As nice as the mic itself is, what pulls this package together is the RÃ˜DE Rec app that maximizes the hardware's capabilities. For best results, I recommend using the included foam windshield and mounting your iPhone on stand. The first version of the iXY Mic is available with a 30-pin Dock Connector. But it appears that Rode is working on a Lightning connector version too. I give the RÃ˜DE iXY Stereo Mic a very high Nimbleosity rating. 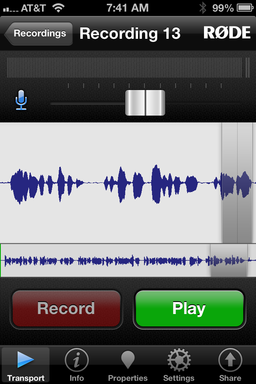 It allows me to use my iPhone for recording on the go instead of having to carry a separate device. I'm sure you'll hear a podcast recorded with it before long. This one, while it may be wonderful, is pretty pricey. Can you give us a recommendation of something less so? I too was looking for a high quality portable recorder recently and while I'm sure this model from Rode is high quality, it will soon be out of date simply because of the dock connector. I ended up buying the Zoom H1 for half the price and it is future proofed as a stand alone unit. Granted, you have to carry another piece of kit with you though. I think it's a bit cheeky asking $6-00 for the app on top of the mic. How about using it with iPad and Garageband instead of the Rode app?